At an event held in London, Chinese original equipment manufacturer (OEM) Huawei, today, took the veils off its latest flagship smartphones, the Huawei Mate 20 and Mate 20 Pro. The devices —as previously confirmed by rumors, leaks, renders, and speculations — are monsters! Let’s have a quick look at what the new Huawei flagships bring on board. The Mate 20 is, specs-wise, the smaller device of the duo. However, when body dimension and screen size are the basis of the comparison, the Mate 20 is the bigger one. This device comes with a 6.53-inch IPS LCD display with a 2240 x 1080 pixels resolution and a 381ppi pixel density. 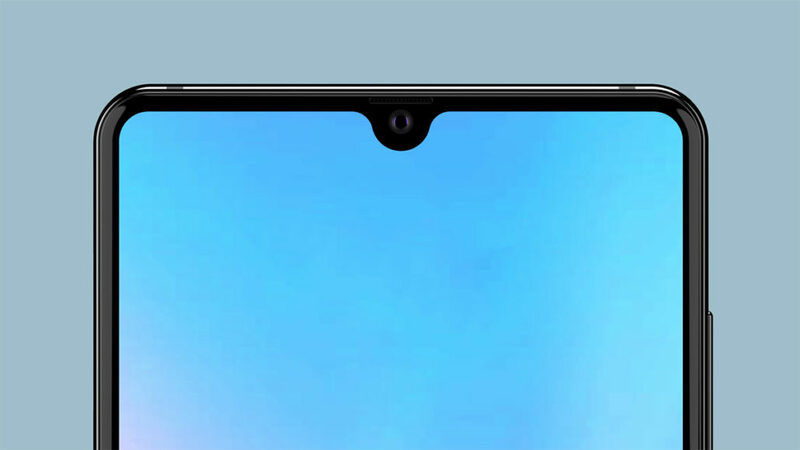 The display is in 18.7:9 aspect ratio and houses a water-drop notch where the front-facing 24-megapixels selfie camera is embedded. The notch, the device’s earpiece, and display are pretty much the only components on the front — with the display occupying up to 90% of the frontal real estate. – 8MP Telephoto 52mm lens with f/2.4 aperture. On the inside, the device is powered by Huawei latest HiSilicon Kirin 980 chipset. The Kirin 980 chipset was announced in August at the IFA 2018 event that held in Berlin as the world’s first 7nm chipset. Huawei debuts this chipset on the Mate 20 and it is expected to bring about 75% to 150% boost in performance and 50% more power efficiency. The Kirin 980 comes in a total of 8 cores: two big Cortex-A76 cores that clock 2.6 GHz, two medium Cortex-A76 cores with a clock speed of 1.92GHz, and four small 1.8GHz Cortex-A55 cores. The Kirin 980 SoC is paired with a Mali-G76 MP10 graphics processing unit. Huawei is lacing the Mate 20 with its EMUI 9.0 which will be based on the latest version of Google’s operating system, the Android 9 Pie. In terms of storage, the Mate 20 is available in two (4GB or 6GB) RAM variants but internal storage is fixed at 128GB of storage. A 4,000mAh battery keeps the Huawei Mate 20 up and running. The device comes with 22.5W SuperCharge for reasonably fast charging. The base model of the Huawei Mate 20 with 4GB RAM will retail for €800 while the 6GB model will cost you fifty more Euros i.e €850. The Huawei Mate 20 Pro comes sophisticated specs that makes it the best member of the Mate 20 series. 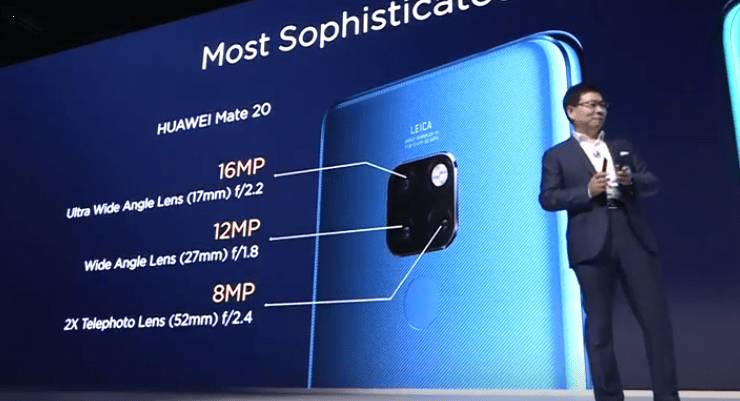 Unlike the original Mate 20, the display of the Mate 20 Pro have been shrank to 6.39-inch. However, the quality makes it arguably one of the best displays you’d find on a flagship smartphone. 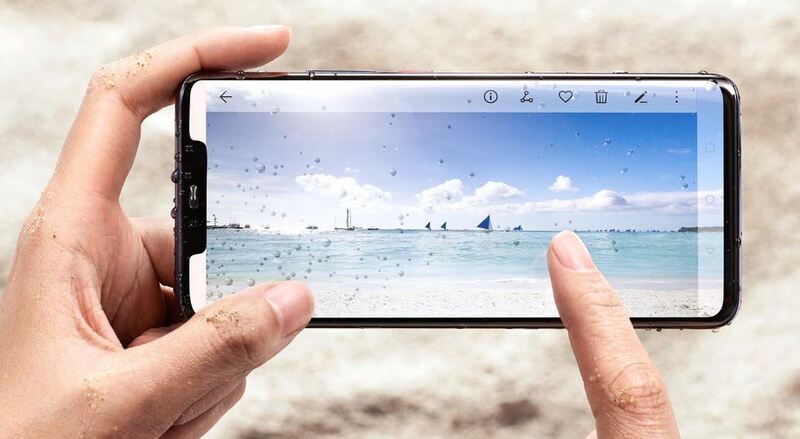 The Mate 20 Pro has a curved OLED display in 19.5:9 aspect ratio, 2K+ (3120 x 1440 pixels) resolution and reduced screen-to-body ratio (87.9%). Still on the display, the Mate 20 Pro also comes with a notch. But this time, an iPhone X-esque style of notch was used on the device. The best part of the device’s display, however, is its in-display fingerprint sensor which Huawei says is about 30% faster than older generations of under-display fingerprint sensors. 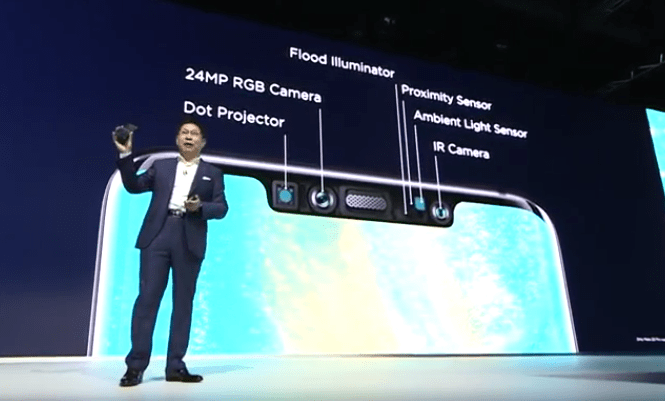 The notch houses the 24MP RGB selfie camera, Dot projector, earpiece, IR camera, ambient light sensor, proximity sensor, and flood illuminator. The front-facing camera and dot projector alongside other sensors make up the Mate 20 Pro’s face unlock system for 3D facial scan. 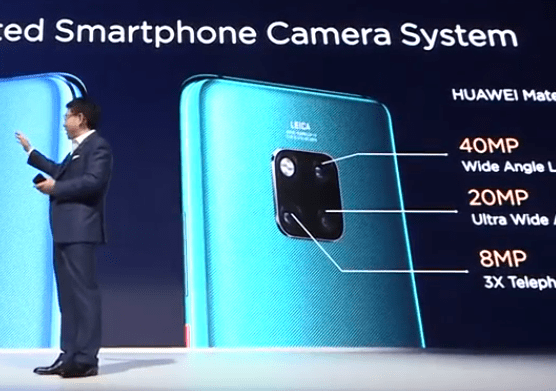 On the rear, the Huawei Mate 20 Pro also comes with triple rear camera setup and the same type of lens as the Mate Pro, but in different configuration. The primary wide-angle camera has been beefed up to a stunning 40-megapixels with f/1.8 aperture; the ultra wide-angle lens — 20MP f/2.2; and the telephoto lens — 8MP f/2.4. Some standout features of the Mate 20 Pro’s camera include Super HDR, improve low-light photography, macro photography etc. Unrelated, but the Huawei Mate 20 and Mate 20 Pro’s triple rear camera setup both look super promising and just might give the recently launched Galaxy A7 (2018) and Galaxy A9 (2018) —with triple and quad rear-camera setup respectively— a run for their money. The Mate 20 Pro comes with 6GB of RAM, 128GB of built-in storage, with run the Android 9 Pie out-of-the-box, and is also powered by Huawei’s Hisilicon Kirin 980 chipset in the same Octa-core configuration. Battery juice of the device is bumped up (to 4,200mAh) and likewise, charging speed. The Huawei Mate Pro 20 supports 40W SuperCharge fast charge technology — meaning the Pro 20 will charge faster than the original Mate 20. Furthermore, the device can be charged wirelessly and supports what Huawei calls “Wireless Reverse Charging”. This means the Huawei Mate Pro 20 can double as a charging mat/pad which you can use to charge other devices that supports wireless charging (e.g the iPhone X). This is the first device in the world to sport such feature. The Huawei Mate 20 Pro has an official price of €1,050. Both the Mate 20 and Mate 20 Pro are available in the same colour variants: Emerald Green, Midnight Blue, Twilight, Pink Gold, and Black. There’s a Porsche Design of the Mate 20 Pro with 8GB/256GB combination and €1,695 price tag while the 8GB/512GB model will set you back by €2,095. This perhaps is the long-rumored 512GB smartphone that Huawei reportedly had in the works.